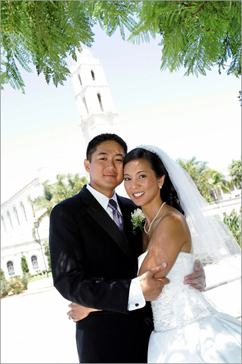 No place in San Diego offers more beautiful and scenic wedding photography locations than Balboa Park, which contains 20 different flower gardens, 15 museums, and 9 performing arts centers. You'll wish you had more than a few hours to explore this magnificent park! Have your wedding photography situate the bridal party in front of the glimmering fountain at the park's entrance. Venture inside and take some photographs around the formal, Spanish-style Alcazar Garden. The tranquil Lily Pond, located at the foreground of the Botanical Building, is a perfect place for a portrait of the bride and groom. The Case del Rey Moro Garden also contains a cozy marble chapel where your wedding photographer can pose the happy couple. Finally, head over to the Parker Memorial Rose Garden, one of the most frequented locations in the entire park and a popular choice for wedding ceremonies. Besides its numerous vibrant gardens, Balboa Park offers some of San Diego's most elegant and diverse architecture, which will provide perfect backdrops for your wedding photographs. 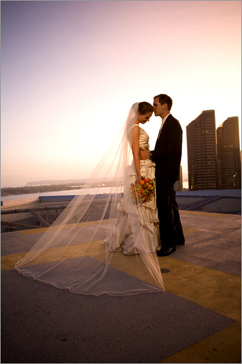 Begin with the ornate exterior of the Museum of Photographic Arts, where your wedding photographer can assemble a portrait of the groomsmen, bridesmaids, or just the bride and groom beneath the marble arches. The Fleet Science Center can also be a great spot to arrange the bridal party (just take care to keep the bride's wedding dress at safe distance from the large fountain outside the building!). Finally, stroll over to the Museum of Man, where your wedding photographer can assemble a portrait of the bridal party. The museum's beautiful Spanish colonial-style architecture, along with the stunning 200-ft tall California Tower, will serve as magnificent backdrops. After you've had a taste of the San Diego's most famous cultural park, you'll definitely want to come back for more! If the sunny beaches of San Diego and the sparkling blue waters of the Pacific Ocean tickle your fancy, then look no further than La Jolla for your wedding day photography session! You can begin the photo shoot at the elegant and expansive Hilton La Jolla Torrey Pines hotel. Your wedding photographer can start the day by taking pictures in the lobby. Organize a gentleman's portrait at the bar or a girls-only shot along the length of the stylish front desk (make sure to have your photographer ask the staff for special accommodation for the latter option). You can then venture outside for a group photo of the bridal party at the hotel entrance, along the extravagant bed of flowers and palm trees or using building's architecture as background. Take advantage of the lush greenery surrounding the hotel and have your photographer take some quality portraits on the lawn, with a stunning view of the ocean as a backdrop. After exhausting all your options at the hotel, get ready to explore the white beaches of San Diego! La Jolla Cove is located only a few minutes away from the hotel and once you arrive, you'll be thankful that you chose beautiful San Diego for as your wedding destination. The pier is a perfect spot to take a snapshot of the bride and groom and your wedding photographer can spread out the groomsmen and bridesmaids behind the couple as a supporting cast. The gentle late afternoon sun, combined with the glittering ocean, will create the perfect conditions for a beachside photo shoot. Leave the pier and have your photographer find an ideal (but safe!) location on the cliffs overlooking the beach for a portrait of the bride and groom. Finally, the bridal party can descend down to beach level for some playful pictures along the coastline. Make sure to have the bridesmaids assist the bride with her veil and dress for this part of the photography session. If the bridal party isn't too worn out from all the beachside fun, have your limo driver cruise over to the secluded La Jolla Country Club only a few minutes away. The Colonial-style clubhouse will be great for stretching your feet and will provide a tasteful backdrop come picture time. Stop for a drink or two at the clubhouse bar, where your photographer can sneak a few more photos and explore the Club's interior. 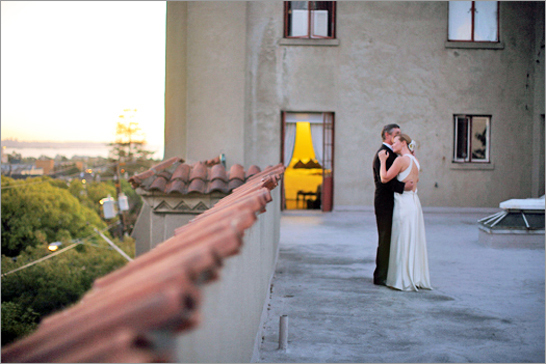 La Jolla Country Club offers four luxurious banquet rooms, each with a breathtaking view of the Pacific Ocean. Afterward, take a leisurely stroll along the golf course. Your party can even have some fun in the rental golf carts ' a sure source of comic relief after a long day. Whichever itinerary you choose, you will undoubtedly be overwhelmed by all of the sunny splendor that San Diego has to offer.